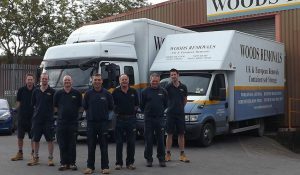 Removals Company West Dorset, Woods Removals West Dorset Ltd.
For a removals company in West Dorset that you can trust with every aspect of your house-move, you couldn’t make a finer choice than Woods. With a history stretching back a century and a half, our experience and expertise cannot be matched elsewhere. In fact, it’s only with time that all the problems inherent in moving can be ironed out – we’ve had to deal with them all, and as a result, we’ve got every solution at hand, so that your move can be seamless, smooth and stress-free. Our BAR-accredited (British Association of Removers) movers, drivers and packers come to you with their quality assured. We’re also intimately familiar with the area, which means that we can plot a route from A to B that gets you there as quickly as possible. We can also help with packing up all your possessions. We take the assignment seriously and have all the necessary packaging and equipment so that even the most challenging of objects, be they pianos or works of art, are handled appropriately and kept utterly safe in transit. It’s an unfortunate fact that not all removal companies in West Dorset extend this degree of consideration and diligence to their clients. The moving process begins with our estimator paying you a call to ascertain all the details of your relocation and then issuing you with an accurate and easy-to-follow quotation. You’ll find all our estimators courteous and helpful, and more than able to discuss any aspect of your move with you so that your worries are allayed. We’re not just a mover – if you need storage in West Dorset, you’ve come to the right place. Our first-rate facilities can come to your aid, whether you need then long-term or short. Our additional services also include international and European removals and office/corporate relocation. Get in touch today and find out just how well your move can go when you move with Woods. Quality like ours can only be acquired with time – and we’ve put in 140 years so far, with many more to come, moving happy clients every day, all over the country.